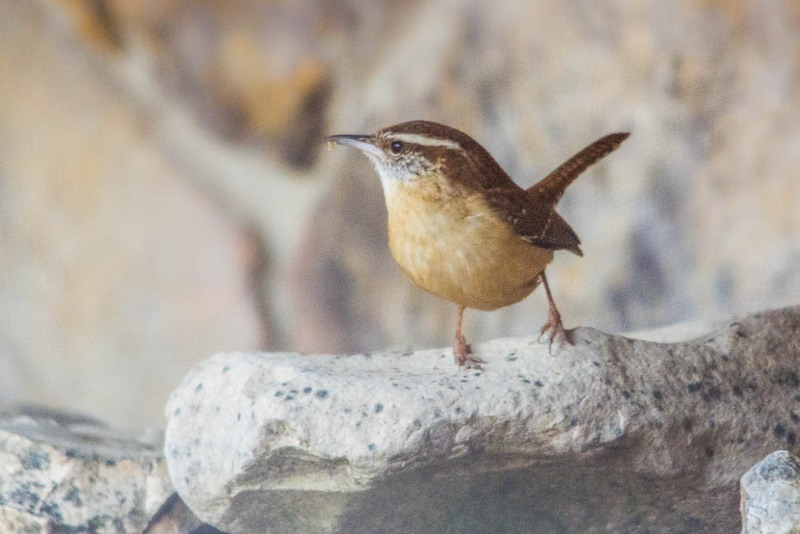 Lately, a pair of Carolina Wrens have been frequenting our front porch, eating the dried mealworms we put out for them. 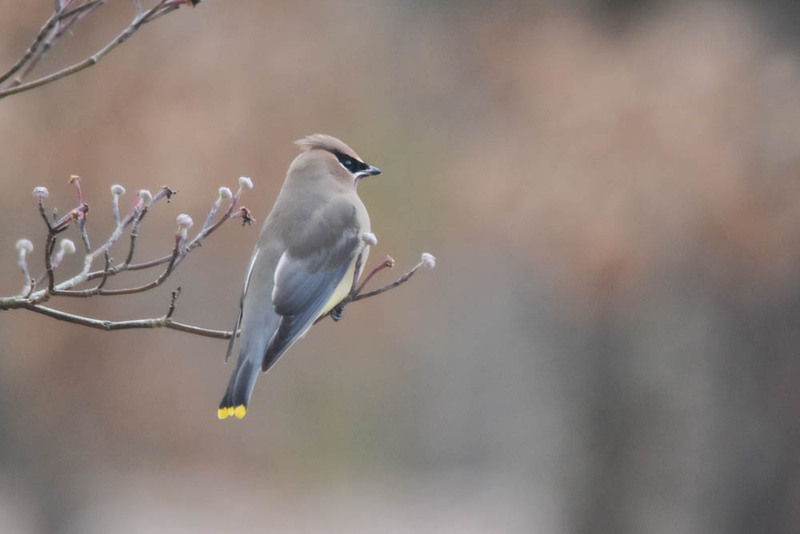 In harsh winters, supplemental food can make a difference in their survival. Our motives, however, are not entirely altruistic. We just like to watch them. 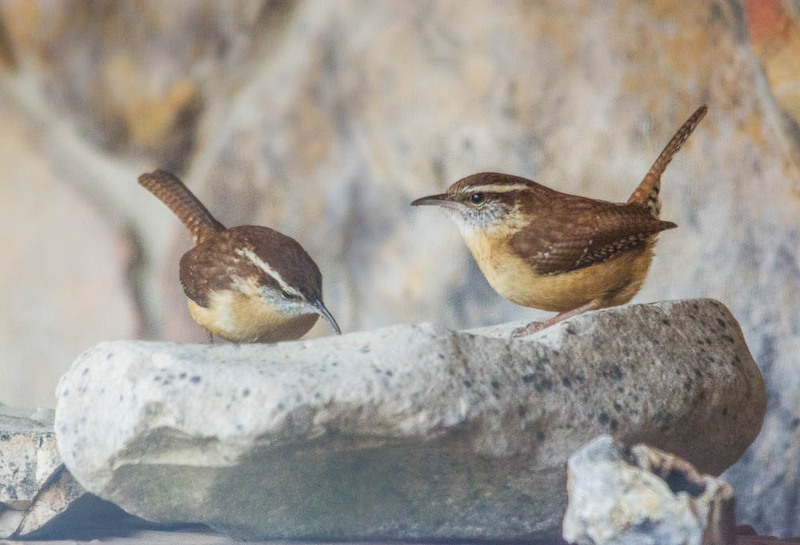 What is it that so captivates us with Carolina Wrens? On pogo stick legs, their movements are quick and unpredictable, like chipmunks with wings. With their tails held high over their rounded frames, they nearly always seem happy. But what fascinates me most is the male's melodious voice, like an adolescent American Idol star. Whatever the reason, they always make us smile. And that's worth a lot. Everything needed to be done yesterday, and it didn’t seem like there was going to be time for Christmas at all this year. Don’s company had recently merged with a Century 21 office in Mountain Home, Arkansas, which, we think, is a good thing, and might eventually give him a way to get out of the office once in a while. We knew there would be some things to change. There would be a week or two of transition, we figured, and then everything would be running smoothly again. What we hadn’t anticipated was the mountain of paperwork attached to each of Don's real estate listings as we acquired signatures and assigned the listings to the new company. Customarily, I work with Don for two days a week in the office, besides taking pictures and tending his website and a few other miscellaneous gofer jobs, but since the transfer, we've been working night and day to get everything done. Last Friday, with no Christmas decorations up, and no inspiration for a Christmas card, I took a break and met with two friends, Virginia and Dianna, at Virginia's quaint old farmhouse. We sat around the kitchen table and did what we have been in the custom of doing for the past few years; reading the Bible together. This time, we were reading in the gospel of Luke. We read aloud in turn, and as we came to the familiar story of God coming to earth in the form of a baby, a thought took hold in my brain. I tried to shake it, but it wouldn't let go. 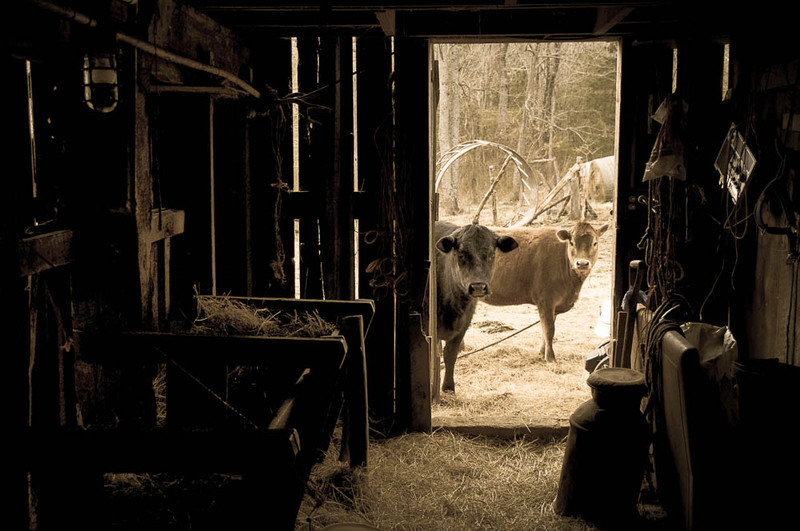 "The barn,” I mused, “the barn!”, I repeated. My friends looked at me like I was on a different page. Outside the farmhouse where we sat was an ancient barn, built to last, with sturdy timbers, stanchions, and mangers for the cows. Those feeding troughs were just the right size for a newborn baby. I asked Virginia if she had a doll. "I have a life-sized doll that was my mother's," she replied. I told them my idea, and we sprang into action. Virginia's dish towels became the swaddling clothes that Dianna used to wrap the baby, and we trooped outside, over the rain-softened ground, to the barn. 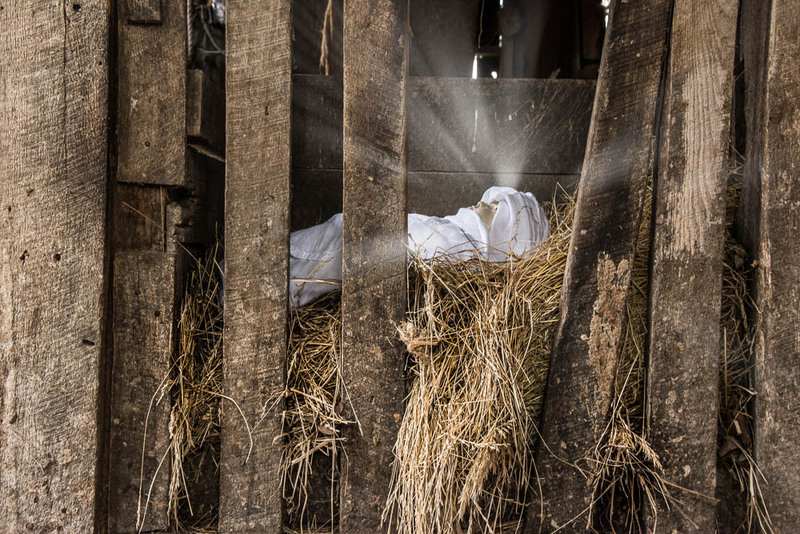 As I set up my tripod and camera, my friends arranged the hay and laid the baby doll in the manger. There have been untold thousands of images of that scene of long ago; why did I need one more? I can only say that this was a way for me to visualize the birth of Jesus and remember what He did when He gave His life for us. Now there's a wreath on the front door and a small Christmas tree on the dining room table and my favorite creche in the kitchen. The work will get done, but not today. I hope you'll consider this my Christmas greeting, and I especially hope that God's gift, His indescribable gift of Jesus, brings peace to your heart today and in the coming year. The cows are no longer on the farm. This picture was taken years ago, but I like to think of them looking in on the baby Jesus. During my college years in Portland, Oregon, I loved to hike in the Columbia River Gorge. My favorite trail was at Eagle Creek, a place lush with deciduous trees and punctuated by breathtaking waterfalls. I remember one trip with some of my college girlfriends. A long trek provides plenty of time for conversation, and as we walked through the forest, our talk turned to one of our favorite topics at the time— what our future husbands would be like. Cary hoped hers would be musical, as she was. Robynne was looking for an athlete, and all of us wanted a man who was good with people, who was smart and funny, and who loved us deeply. Wild Game Hunter wasn’t on anybody’s list, not even on anyone’s radar. Love can take us to places we don’t expect. When I married Don, hunting, and everything that went with it, was part of the package. Fortunately, Don didn’t expect me to hunt, but he did appreciate a little help processing the meat. From the beginning, he did the messy stuff; the gutting and skinning, discarding the unused parts and cutting the deer into manageable sections. He brought those into the kitchen, and that’s when I started to help him. At first, I was squeamish about even cutting up the meat. When I grew up on the northern California coast, we didn’t have venison at our house, but we had shrimp and crabs. Processing them was a smellier proposition and a little more painful, but the result was the same--food on the table. On one occasion, a friend who was a commercial fisherman brought us a crab box full of bay shrimp. Mom and I stood over the kitchen sink for what seemed like hours and shelled them. We reeked of shrimp, and long before we were done, our backs were aching and our fingers raw with little cuts inflicted by the tiny claws. But Mom was looking closely at those marvelous creatures in our hands and using them as a teaching tool. 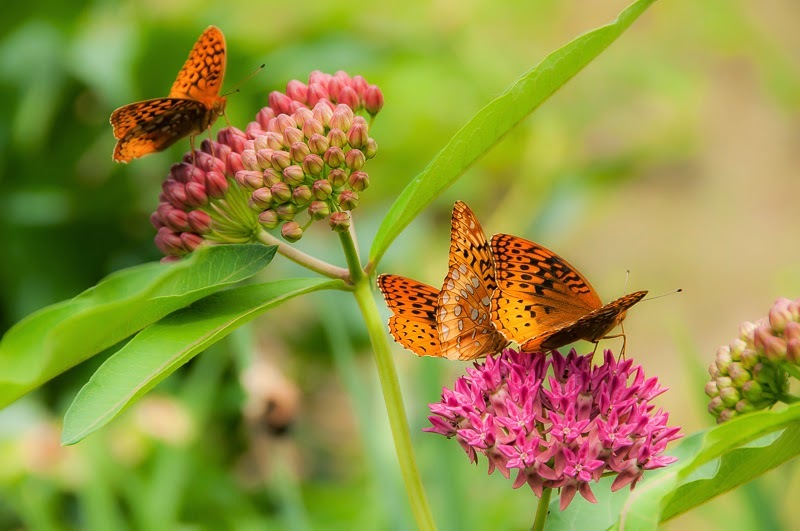 She reminded me that God had designed them in His infinite wisdom for a particular purpose and that He had a purpose in mind for each of us, too. It was a good thing to remember as I examined the muscles, cartilage, and connective tissue of the deer. There was much to appreciate there, even beyond the meat that would soon be on our plates. After a few seasons, my queasiness disappeared and I began enjoying the process of preparing the venison, the camaraderie with Don and the satisfaction of preparing something that would benefit us for a long time. I even managed to watch him gut and skin the deer, and then I started helping with that a little, too. Last Saturday, on the opening day of the deer rifle season, Don got a buck. Thankfully, it wasn’t a big one, because after he gutted it and we got it hung up in the skinning tree, someone called and Don had to leave to meet a client at work. I started skinning the deer while he was getting ready for work, and as he was leaving, I asked him for some final instructions. "Just get rid of everything that's not venison," he said. So that's what I did, and when I finished skinning it, I cut out the steaks. I thought about what my college friends would say if they could see me. But then, I imagine love has taken them to places they didn’t expect, either. A skiff of snow fell overnight, and in the morning, the dogwood tree in the front yard, so glorious just days before, wore its leaves in patches like a mangy dog. 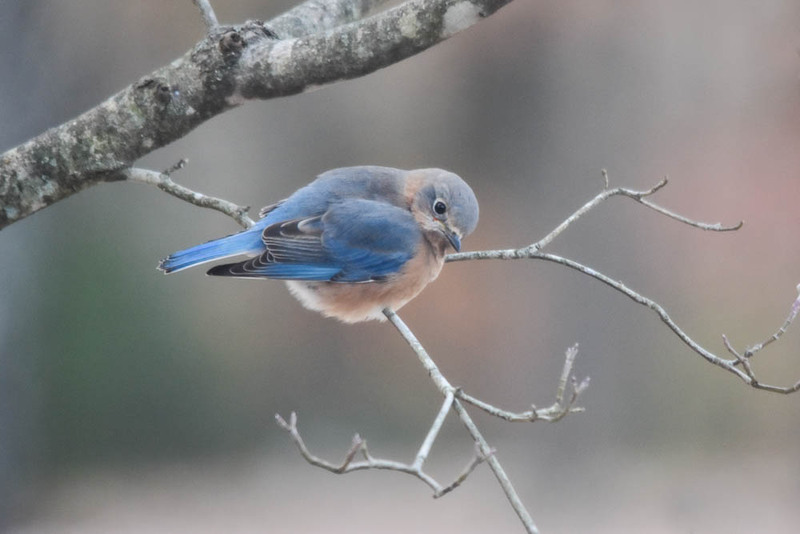 A bluebird flew in and landed on one of the thin branches. Another joined it, then another, followed by waxwings and robins, as if the fallen leaves had sprouted wings overnight and were back, standing in as replacements. It isn't a bad trade-off. For the leaves, their first flight is their last, but the birds keep flying. They animate the tree in a way leaves never can. The few dogwood berries that remained were strewn on the ground. Taking stock of the inventory, the birds hopped to the ground to bolt down their breakfast. 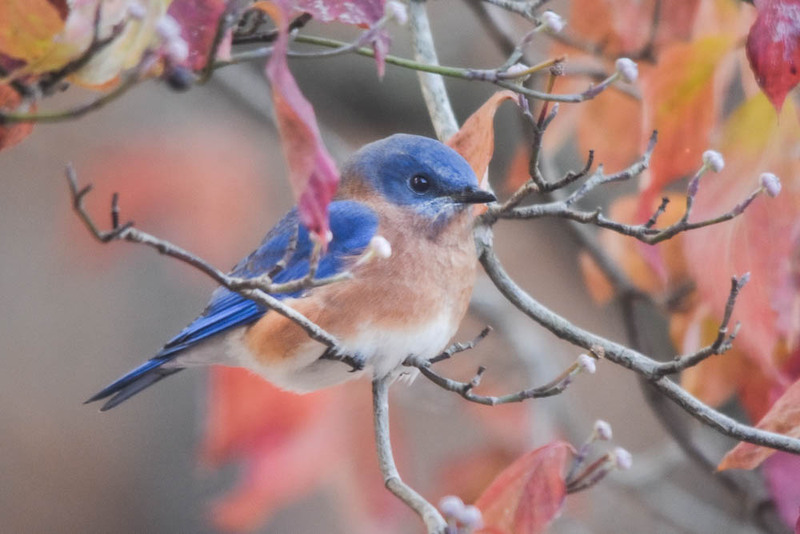 One bluebird peered under a leaf, located a neon red berry and swallowed it whole in one gulp. Within a few minutes, the flock had cleared the yard of berries and moved on. Not all of the birds were so fortunate. 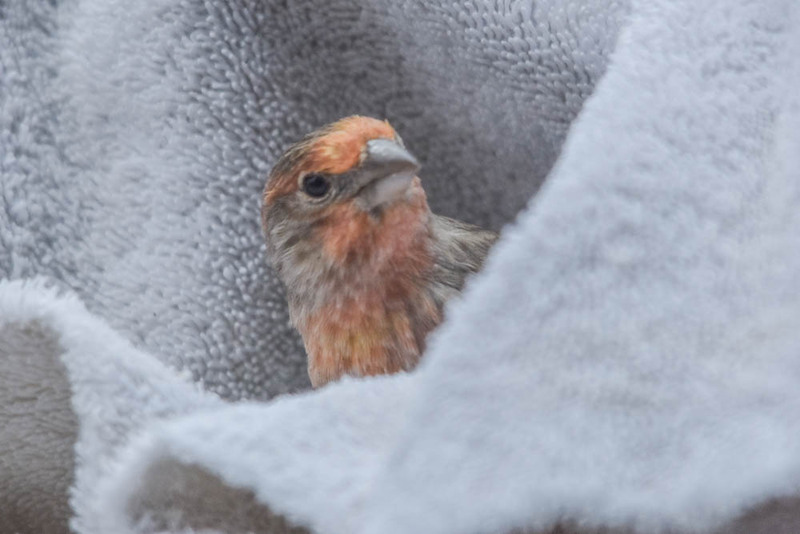 A purple finch crashed into our sliding glass door and laid on the deck like a fallen leaf before struggling to its feet. Listing to one side, it perched wobbly, hanging on to life with a tenacity known to wild things. 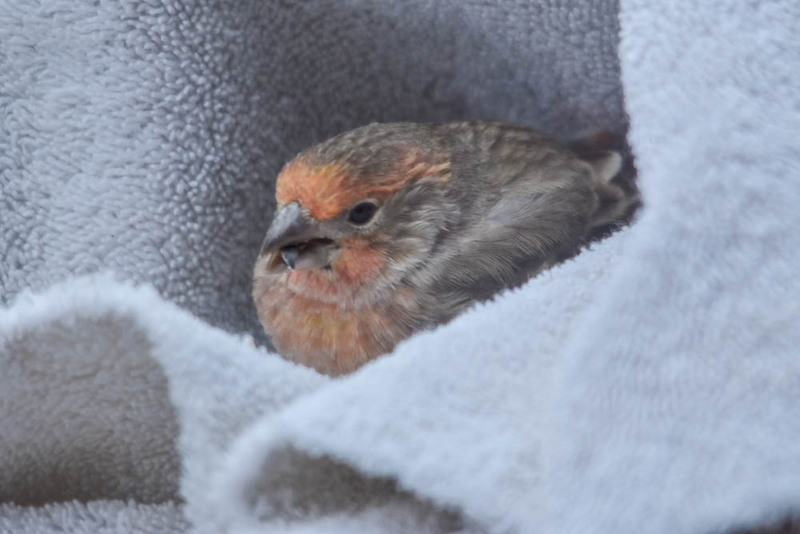 Hoping to shelter it from the frigid breeze, I took an old towel outside, shaping it with a cavity for a windbreak, and gingerly set the bird inside. The finch rested there, unresponsive for some time, an uneaten sunflower seed still in its beak. After a while, it dropped the seed, lifted its head, and surveyed the surroundings with a renewed recognition. It seemed to remember, for the first time in a while, that it could fly. 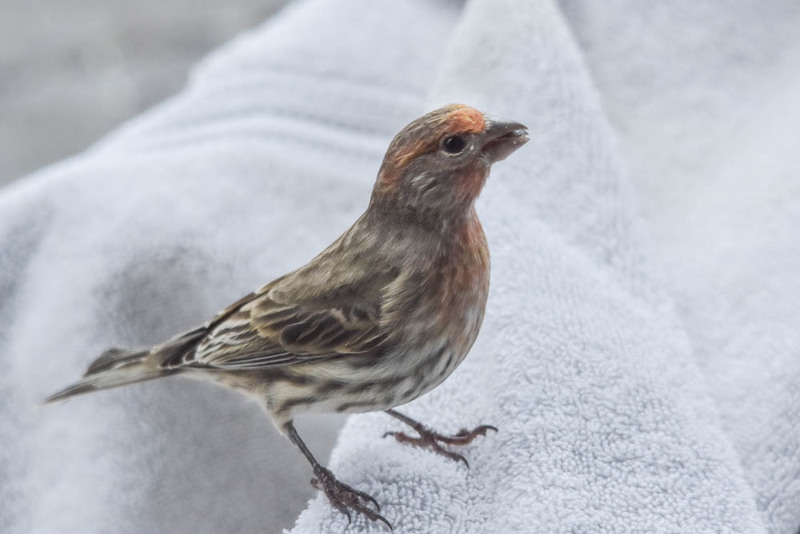 With a swift motion, it picked up the seed again, hopped to the top of the towel, and lifted off. One fallen leaf had taken flight. Don called on the way home from work yesterday. 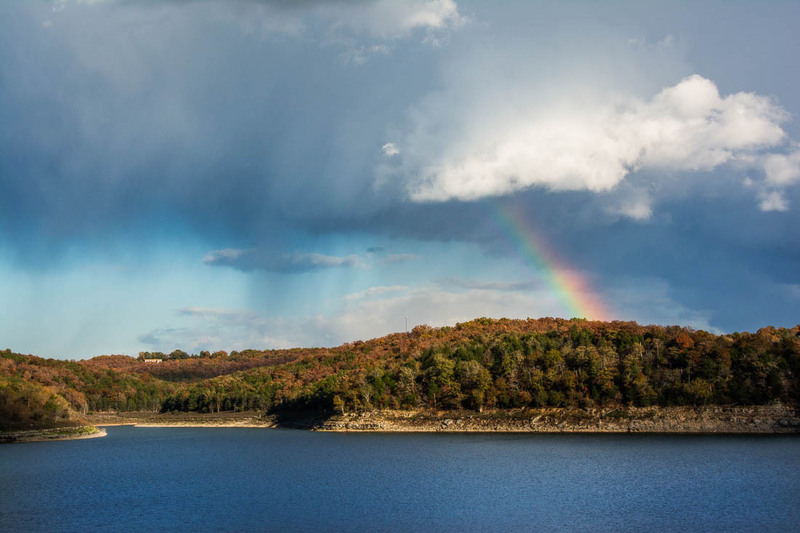 "There's a rainbow in the east," he told me. "If you want to take pictures from the other side of the lake, I'll pick you up in a few minutes." Don has a good eye for photographic opportunities, and it's always nice to have a spotter. As mercurial as rainbows can be, I was also grateful that my personal chauffeur had offered to save me a few precious minutes. We drove to the other side of the bridge and clicked a few pictures. In a matter of 3 minutes, it was gone. If Don hadn't called, I would have still been sitting at my computer, unaware of the glory in the sky.